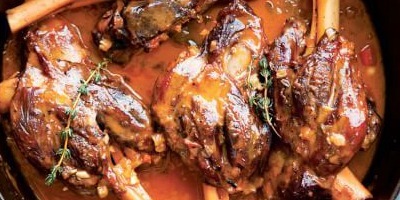 Lamb is a great meat to cook for family gatherings. While keeping in mind that you want to treat your guests; you also don’t want to spend your whole day in the kitchen! This all-in-one recipe is great because it only takes roughly 20 minutes of preparation, but it looks and tastes like the real deal! Little hint for you: This recipe seems long but it’s only because it will slow cook for almost 4 hours in the oven. I would usually do the first 3 hours of cooking in the afternoon and leave the last step of the 45 minutes cooking just before serving. Simply delicious! 4. In the same casserole, add the onion, the garlic, the cumin and the ginger and cook for about 5 minutes. Season. 9. Plate one lamb with a big spoon of barley with the juice, tomato and prunes, and enjoy!